Rejoice! Adult Swim’s fantastic show Rick and Morty is coming back to television by the end of 2016, and will include more episodes than originally anticipated! 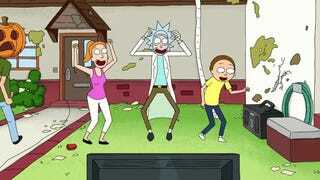 At Magic City Comic Con in Miami Florida in January, Dan Harmon and Dino Stamatopoulos spoke a bit about Rick and Morty, and revealed that they’re planning on releasing the third season in 2016. Shortly thereafter, he noted that “We’re doing 14 episodes this year.” Season 1 of Rick and Morty contained 11 episodes, while the second season was only 10 episodes. There’s some other interesting tidbits here: they noted that Season 2 was supposed to end with two episodes, without such a major cliffhanger, while the purge episode took about half an hour to write. Considering that we had been thinking that the show would return in 2017, this has us very excited!